Enzymes are required for most, if not all, of the processes required for life. Enzymes catalyse a reaction by reducing the activation energy needed for the reaction to occur. However, enzymes need to be tightly regulated to ensure that levels of the product do not rise to undesired levels. This is accomplished by enzyme inhibition. Reversible and irreversible inhibitors are chemicals which bind to an enzyme to suppress its activity. One method to accomplish this is to almost permanently bind to an enzyme. These types of inhibitors are called irreversible. However, other chemicals can transiently bind to an enzyme. These are called reversible. Reversible inhibitors either bind to an active site (competitive inhibitors), or to another site on the enzyme (non-competitive inhibitors). Competitive inhibitors compete with the substrate at the active site, and therefore increase Km (the Michaelis-Menten constant). However, Vmax is unchanged because, with enough substrate concentration, the reaction can still complete. The graph plot of enzyme activity against substrate concentration would be shifted to the right due to the increase of the Km, whilst the Lineweaver-Burke plot would be steeper when compared with no inhibitor. 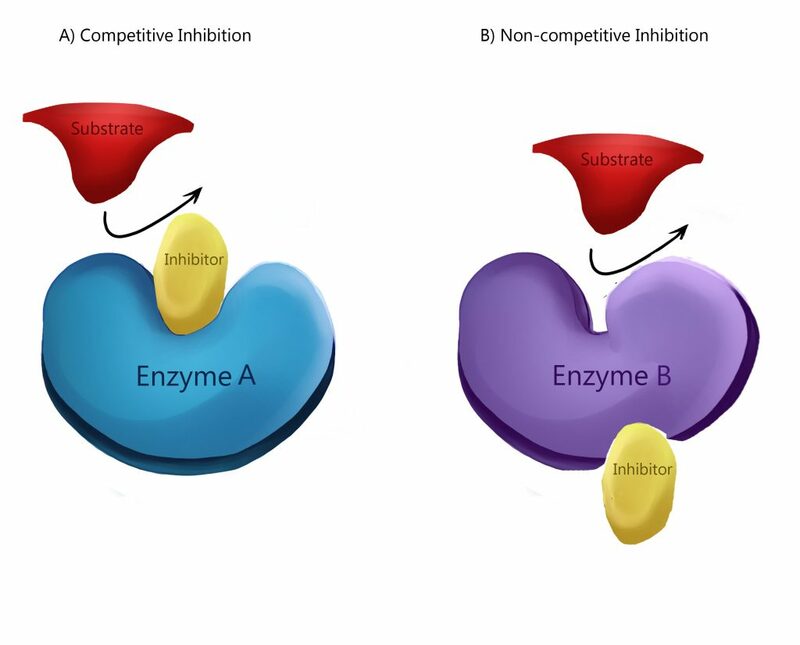 Non-competitive inhibitors bind to another location on the enzyme and as such decrease VMAX. However, KM is unchanged. This is demonstrated by a lower maximum on a graph plotting enzyme activity against substrate concentration and a higher y-intercept on a Lineweaver-Burke plot when compared with no inhibitor. 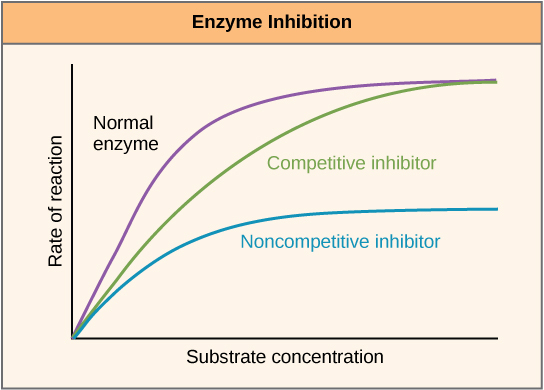 Fig 2 – Diagram to show the effect of enzyme inhibitors on the rate of reaction and how it varies with substrate concentration. Allosteric enzymes display a sigmoidal curve in contrast to the hyperbolic curve displayed by Michaelis-Menten Enzymes. This is because most allosteric enzymes contain multiple sub-units which can affect each other when the substrate binds to the enzyme. Inhibition can affect either K0.5, which is the substrate concentration for half-saturation, Vmax or both. This results in a shift of the curve to the right, and in the case of reducing Vmax, shifts the curve down. Allosteric enzymes have two states: a low affinity state dubbed the “T” state and the high affinity “R” state. Inhibitors work by preferentially binding to the T state of an allosteric enzyme, causing the enzyme to maintain this low affinity state. This is extremely useful to limit the amount of an enzyme’s product, as the product can then go on to inhibit the same type of enzyme to ensure the amount of product is not excessive. This is known as feedback inhibition. For example, ATP allosterically inhibits pyruvate kinase to prevent increased formation of pyruvate, so less ATP is eventually formed. Additionally, phosphofructokinase is allosterically inhibited by citrate, an intermediate of the Kreb’s cycle. This means that glycolysis will be limited when there is high ATP generation from the Kreb’s cycle. 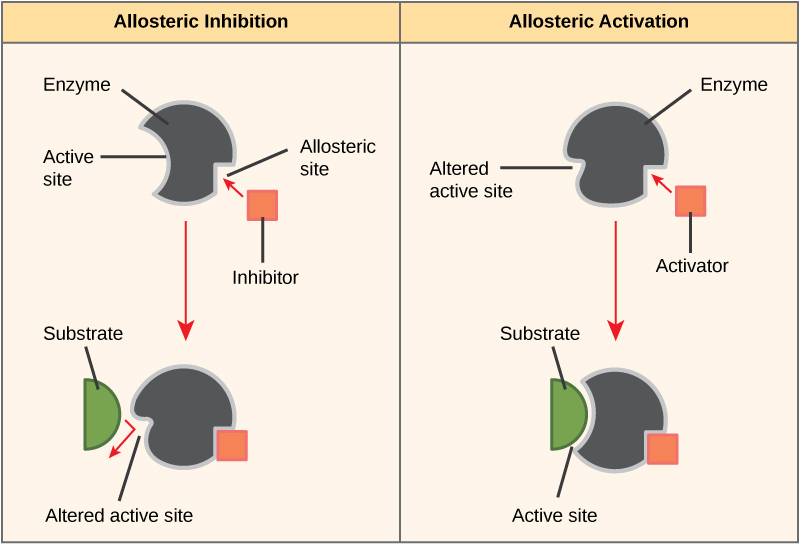 Fig 3 – Diagram to show the mechanism of both allosteric inhibition and activation. Phosphorylation provides another mechanism by which enzymes can be inhibited. This typically occurs through the action of kinase enzymes, which can either inhibit or activate an enzyme depending on the situation. The kinase enzymes cleave off a phosphate group from ATP and binds it to the enzyme. In situations where this results in an increase in enzyme activity it creates a cascade reaction, allowing a large response to be generated from a small stimulus. Enzymes can also be secreted in an inactive state, which are called zymogens. Zymogens are a useful mechanism which allows enzymes to be safely transported to different locations, without the enzyme becoming active and performing its function along the way. They remain inactive due to an addition of amino acids in the protein. Therefore, to activate a zymogen, another enzyme must cleave off these additional amino acids. 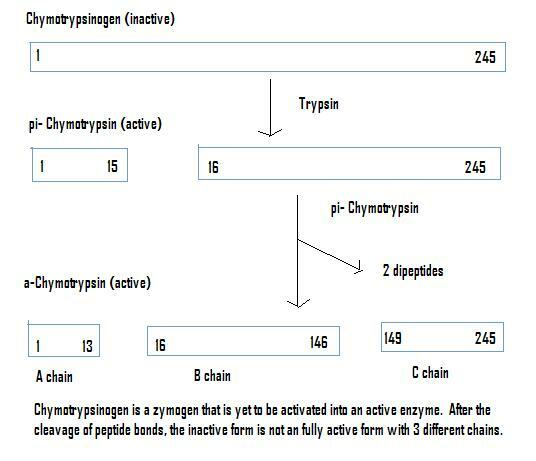 For example, chymotrypsinogen is synthesised by the pancreas, yet is inactivated and cannot function. 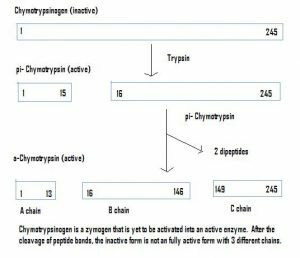 Upon travelling to the intestines, another enzyme (trypsin) cleaves off the additional amino acids to produce the activated form, chymotripsin. The most important clinical use of enzyme inhibition is the use of pharmaceutical drugs. ACE inhibitors are a common treatment for hypertension. Angiotensin I is converted to Angiotensin II by the action of Angiotensin Converting Enzyme (ACE). However, Angiotensin II causes numerous effects which relate to an increase of blood pressure. Therefore, ACE inhibitors were designed to competitively inhibit the action of ACE, which results in less Angiotensin II formation and lower blood pressure. Alternatively, Penicillin irreversibly binds to the active site of an enzyme called DD-transpeptidase. DD-transpeptidase is responsible for the final step of bacterial cell wall synthesis. By inhibiting this enzyme, the bacteria can not synthesize a cell wall and therefore can not sustain life. Finally, Cyanide is an example of a non-competitive inhibitor. Cyanide binds to the final enzyme in the electron transport chain, and prevents this enzyme from catalysing the reaction from oxygen to water. This prevents the flow of electrons down the electron transport chain and no ATP can be generated, which results in death. What effect do competitive inhibitors have? What effect to non competitive inhibitors have? How do allosteric inhibitors usually work?